After you have all the components blocked out on the canvas, you're ready to start adding wires. Select the Edit Tool ( ). When the cursor is over a point that receives a wire, a small green circle will be drawn around it. Press the mouse button there and drag as far as you want the wire to go. Logisim is rather intelligent when adding wires: Whenever a wire ends at another wire, Logisim automatically connects them. You can also "extend" or "shorten" a wire by dragging one of its endpoints using the edit tool. Wires in Logisim must be horizontal or vertical. To connect the upper input to the NOT gate and the AND gate, then, I added three different wires. 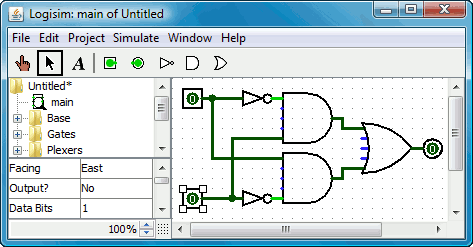 Logisim automatically connects wires to the gates and to each other. 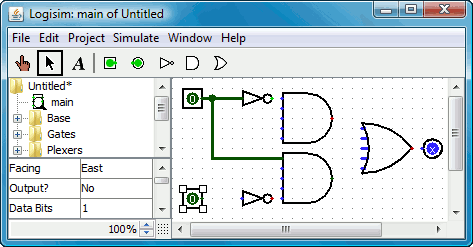 This includes automatically drawing the circle at a T intersection as above, indicating that the wires are connected. If you do have a blue or a gray wire after you think everything ought to be connected, then something is going wrong. It's important that you connect wires to the right places. Logisim draws little dots on the components to indicate where wires ought to connect. As you proceed, you'll see the dots turn from blue to light or dark green. Once you have all the wires connected, all of the wires you inserted will themselves be light or dark green.